A mapping of the complex web of organizations and initiatives through which regulators around the world are now interacting is a first step in the mission of the International Coalition of Medicines Regulatory Authorities (ICMRA) to better coordinate resources in addressing global challenges. Strengthening the capacity of governments around the world to regulate biotherapeutics and biosimilars in the effort to increase patient access to high quality products will remain a key priority for the World Health Organization (WHO) in 2017. During December, IPQ explored how the increasing complexity, diversity and importance of drug/biologic/device combination products are driving regulators and industry to seek clearer, more risk-based and more harmonized regulatory processes and expectations. 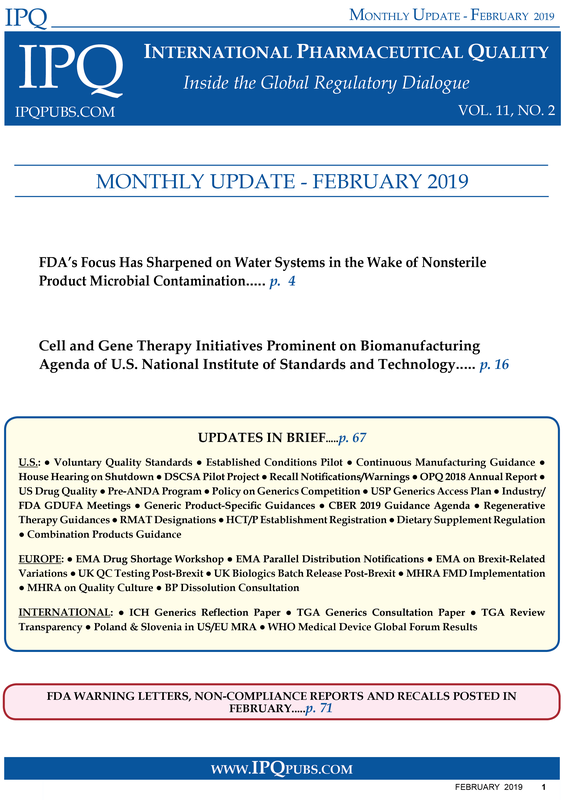 The first story focuses on the situation in Europe, and the second on the industry initiatives underway in the US, Europe and globally to help address the combination product regulatory challenges. In October and November, IPQ was focused heavily on the experience and learnings FDA has gained in the first five years of its biosimilars review program and the improvements that the agency and industry want to see happen with user fee help in moving forward. Also in focus in the international section of the Update are: ● advancing and harmonizing other aspects of the biotech product CMC review process, including accelerated pathways, and ● the current pressure and incentives to apply QRM to excipients. Clearer, more review/inspection coherent, more risk-based, and more harmonized regulatory expectations across the expanding universe of drug/device combination products will continue to be a high-priority focus for the pharmaceutical industry during 2017. The challenges of the CMC regulatory process for drug/device combination products are getting increasing attention in Europe as industry and regulators join in the search for clearer and more efficient communication channels and regulatory procedures. IPEC leaders are touting the multilayered benefits to excipient manufacturers and their pharma customers of establishing and documenting the more formal risk assessment processes called for in the recent industry and regulator excipient GMP standards. While cautioning industry that developing a biosimilar remains a challenging marathon, FDA’s Office of Biotech Products (OBP) is now able to offer a lot more concrete advice on what it takes to cross the finish line. The Biosimilar User Fee Act (BsUFA) reauthoritization process has driven an intensive assessment by FDA of its growing body of regulatory experience to determine where the difficulties have been in the first five years of the user fee program and what can be done to address them. The impact of accelerated clearance pathways on the deployment of the analytical method toolbox for biotech products is among the issues drawing attention at industry/regulator conferences where the CMC challenges and the experience to date in accelerated review are being discussed.